Basketball is a significant part of American culture, which is why it’s not uncommon to find a basketball hoop at every second driveway in America. However, they don’t last forever, so if you need to replace yours, you may be keen to look around and see what’s available. Find out whether you want a baseboard and net you install on your garage or one on a pole that sits in a base stand. These tend to be more portable but move around a lot. Then, consider the price and who will be using it. You can then check out these options below to see if any take your fancy. A problem with much of the basketball hoop selection on the market is that they are often all the same height. If you are too tall or too short, you are not going to be able to play basketball as well as you would like. That’s why this basketball hoop from Goalsetter is such a favorite amongst ballers. It’s exceptionally adjustable so that almost anyone can play their best game. It comes with a 60-inch backboard, so you have minimal risk of the ball going in the opposite direction, not to mention a premium stability system for keeping it in the ground. Once you install it correctly, it stays firmly in place – no matter how hard you throw the ball. To further accentuate this strength, this basketball hoop has a seven-gauge steel one-piece pole, 1.5-inch steel tubing, and a ground anchor hinge system. Are you worried about rust? Don’t be. The corrosion-resistant paint will be the icing on the cake. This robust, high-quality basketball hoop is all about making people happy. You can adjust it up to ten feet high, all the while not being exorbitantly expensive. If you’re in the market for a new hoop, there are several reasons why you should look at this one. If you don’t have room in your home or yard for a full-sized basketball hoop, then this mini version could be the way in which to satisfy your sports craving. While you won’t be able to do the same slam dunk you’ve been practicing on the court, you will get near enough to it with this SKLZ product. It’s far smaller than a regular basketball hoop, but it’s of the same quality you would expect of the larger version. The 18 x 12-inch backboard has shatter-resistant materials and, even though it flexes, is a solid board that will instill a lot of confidence as you play. The hoop is equally as durable and is nine inches in diameter while featuring steel. You can install this basketball hoop on your door with the included mounts and enjoy knowing the foam can stop a lot of damage. It might not prevent all damage in your home, but at least a fair amount. The icing on the cake is that you get a ball with the hoop and that you can choose from a regular or extra-large one. This product will suit a range of amateur ballers. 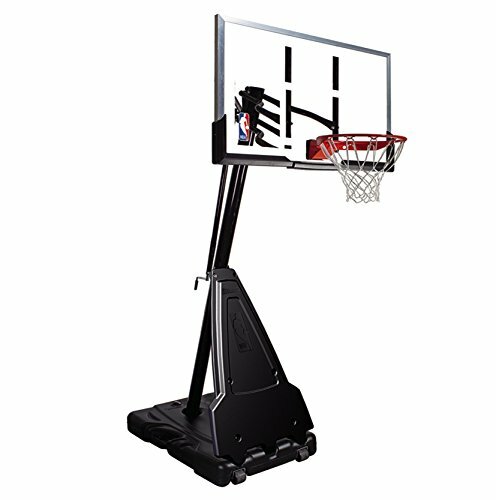 If you think your child is going to be the next Michael Jordan, then it might be time to buy them this basketball hoop from Giantex for Christmas or their birthday. Not only do you not need to worry about making it a permanent addition to your wall or roof, but you can move it indoors or outdoors – or wherever you please. 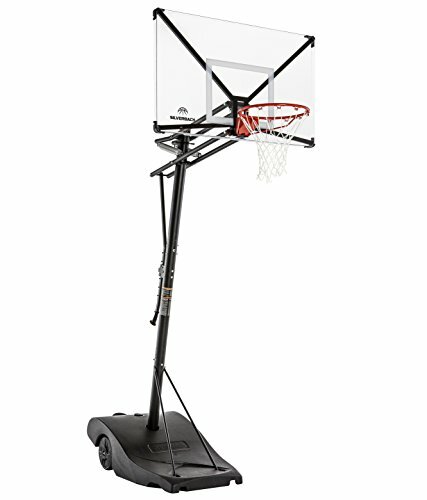 It comes with an in-ground, heavy-duty base, a shatterproof PE and PVC backboard, and wheels that make it effortless to move around. However, while you’re playing, it won’t wobble or move – even when you make that slam dunk. All components are solid. If your child is growing, let the basketball hoop grow with them. You can adjust the height of the hoop to suit their needs and experience level. If you plan on placing this basketball hoop outside, then you will be pleased to know it can handle the weather. The net features weatherproof nylon, while the heavy-duty pipe construction will withstand everything mother nature can throw at it. Aside from the tricky assembly process and how the net can work itself loose, this hoop will be one of the best gifts you ever give your children. If you don’t want to skimp on quality when it comes to a basketball hoop because you want it to last for a long time, then this Pro Slam version could be the answer. Don’t waste your money on a basketball hoop you will need to replace all the time. Instead, buy one that has high-quality materials so it will last the test of time. 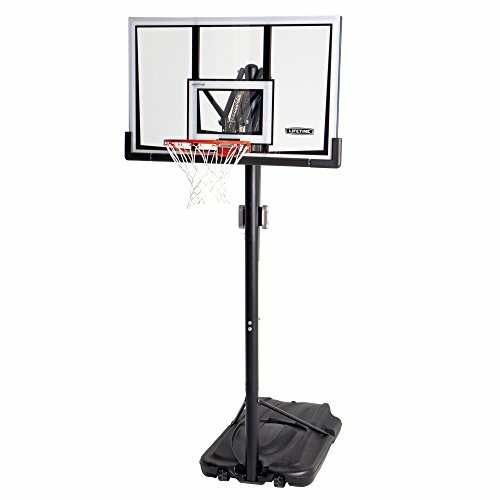 This basketball hoop has a tempered glass, shatterproof polycarbonate backboard, coupled with a powder-coated steel pole. Not only will it handle all those slam dunks you put it through, but not even the weather will see this basketball hoop succumb to the elements. It also comes with an in-ground system which, although it’s tricky to install, will make for a wobble-free game of basketball. You can adjust the height from five feet to ten, enjoy the double-spring ring that will handle a lot of pain, and enjoy the overall style that sees this basketball hoop stand out from others on the market. The best part is, you can set this hoop up at your house or even a school, and it will be suitable for all the kids in the area. It’s well worth a closer look. If you are trying to treat the kids to something special for their birthday or Christmas, then consider buying them this basketball hoop from Aosom. For the basketball-mad fans in the family – including mom and dad – it’s going to be the best gift ever! 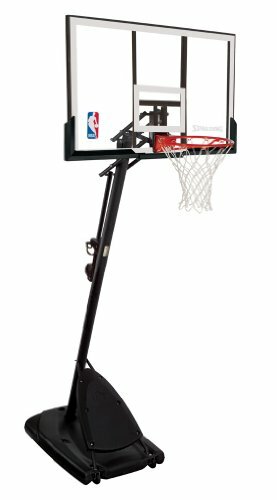 This height-adjustable basketball hoop stands out from the crowd for many reasons. Firstly, it’s portable. Instead of waiting until you drill a hoop onto your garage to find out it’s in the wrong place, you can move this hoop around on its solid polyethylene base. While it could do with more weight in it to stop it scuffing across the ground in the wind, it’s a robust and durable product nonetheless. Sitting on top of the eight-pound base is the steel, powder-coated and rust-resistant frame. This framework ensures that you can be performing slam dunks to your heart’s content with no problems at all. What’s more, if you find the ten-foot height is too much, you can drop it down to a more acceptable level. Move the hoop around, adjust it, and set it up where you want it. It doesn’t get much more convenient than that. Even though this basketball hoop is not the most affordable one on the market, that doesn’t make it any less worthy of your attention. Instead, you should read on and find out why it has the price tag it does. It’s packed full of features, that’s why. When you buy this basketball hoop, you get to enjoy knowing it’s ideal for every member of the family. It adjusts from 7.5 feet to ten feet, meaning it’s suitable for mom, dad, and the kids to play. It also comes with a 43-inch, shatterproof backboard. No matter how many times you hit the ball against it, it will look as good as new – all thanks to its durable polycarbonate construction. If you find that you’ve put your basketball hoop in the wrong place, it’s not a hassle to move it. Because it has a fillable base on wheels, you can place it anywhere you want. You can then fill it with sand or water to stop it from wobbling around. Giantex has thought of everything, ensuring that your experience using this basketball hoop will be a memorable one. 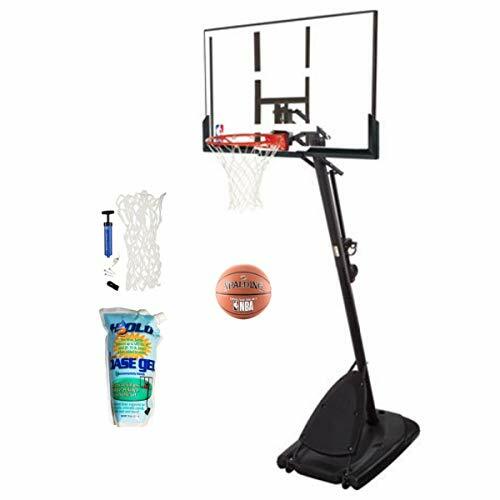 If you’re trying to introduce your children to a fun sport, then there are few better places to start than with this basketball hoop from Lifetime. Instead of buying them a full-size adult hoop that might be a bit tricky for them to master, you can start with one that’s ideal for children before moving up. They get to pick a color they like, including lime green, red and black, green, and blue, and enjoy how they can adjust the height to suit their needs. What’s more, they can fold the rim up and fill the 10-gallon base with the most substantial product they can find like water or sand. The all-weather nylon net will handle all weather too, while every component of this basketball hoop is going to last the distance. Even though you don’t pay a lot for this hoop, you get a generous five-year warranty and a premium hoop that your children will love. If you are not concerned about your basketball hoop lasting forever, then this affordable one from Giantex could suit your needs down to the ground. While it’s not as durable as other hoops on the market, it meets the mark for parents on a budget who want to see a smile on their child’s face for a birthday or Christmas occasion. 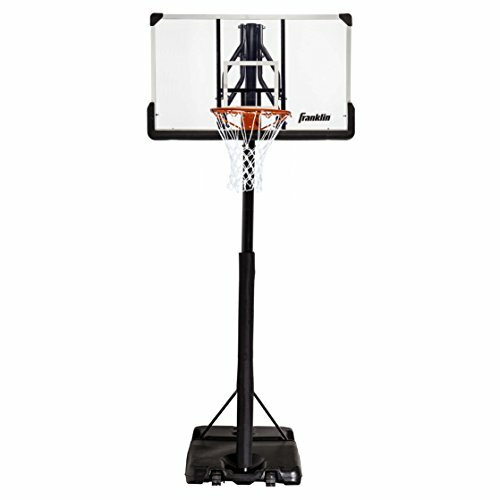 This basketball hoop comes with a 43-inch backboard, a fillable base you can use with sand or water, and a five-inch rim bracket with steel frame. Because it’s on a plate as opposed to something you install on your garage wall, you get the freedom of being able to move it anywhere you like. If you are worried about your children’s height being a barrier, then don’t be. This basketball hoop covers all bases. You can adjust the height of the pole or rim, so it’s as tall as ten feet. The frame is also solid, the bottom doesn’t wobble much, and the kids can get that much-needed outdoor time. While assembly is tricky and not all parts are high-quality, you will love seeing the joy on your children’s face as this arrives in the mail for them. When your children are only young, it can be hard to find a basketball hoop that doesn’t overwhelm them. Full-sized hoops are often too large and tall for young children who are only finding their feet in the sport. 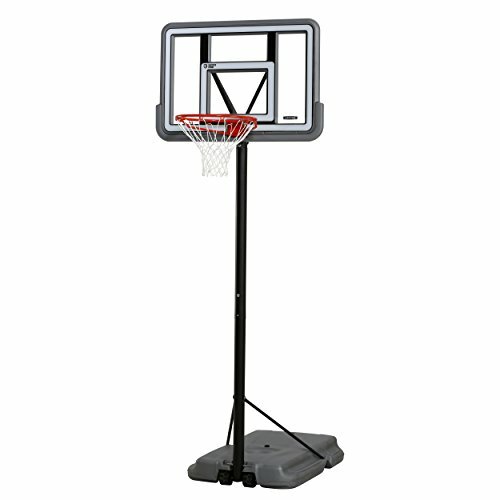 Start them on the right foot with this basketball hoop from Step 2 Shootin’ Hoops. While this hoop is only satisfactory while your children are young, it’s a brilliant stepping stone to get them into the sport. When you bring it home, you will be happy with the style and overall construction. While you have to assemble it – and for some, it’s not easy – it will look incredible once you set it up. You can then extend it from 48 inches through to 60 or 72, but it’s helpful to be aware of the extension points. The plastic supports and extensions are inferior quality plastic that requires you to be gentle. This basketball hoop is entirely portable too, all thanks to its solid base. You can fill it with water or sand to keep it from blowing over in the wind or wobbling as your child goes in for that slam dunk. As they grow and get more confident, you can adjust the break-away rim, so they get a better shot every time. If it’s time for a break, this basketball hoop caters for your child here too. It includes a built-in cup holder for their beverage, as well as a slot for the six-inch basketball that comes with the hoop. While you are not going to use this basketball hoop for a teenager or adult, it’s an excellent stepping stone into the sport of basketball. And, while it’s expensive, it’s all worth it when you see your child’s face light up as they make the shot. If you want your family to get outside, spend time together, and get active, then a basketball hoop is an excellent way to go about it. What’s more, the selection available online will amaze you. However, if you want to get the best basketball hoop money can buy, without skimping on quality, then you need to do your research. An inferior quality hoop is not only disappointing but potentially dangerous too. Here’s how to go about choosing the best basketball hoop for the money. Every basketball hoop is different. Some are a single net with a baseboard you need to install onto your garage or another part of your home. Others come with a pole and a base you need to fill with water or sand. Consider which you would prefer. Hoops with a base can be quite wobbly and unstable, but hoops you have to install on the exterior of your home can leave damage. Some hoops have problems with balance, but until one arrives in the mail, you aren’t going to know whether your hoop has anything wrong with it. That’s why you need to pay attention to customer reviews. Find out what other people are saying. Are there problems with wobbliness? Is the baseboard stable? Can you use the basketball hoop for slam dunking? The price tag for all basketball hoops can vary, depending on the brand on what you get for your money. The more you spend, the more robust and high-quality the hoop tends to be. Don’t be afraid to spend a little more. It might pay off in the end. When you’re on the hunt for a new basketball hoop, the backboard forms an integral part of the decision-making process. It needs to be able to withstand a lot of pain and pressure from a full-sized basketball hitting it at a fast pace. Opt for one that’s stable, features a durable polycarbonate material and flexes only enough to take the hit safely.